United is a transfer partner of Chase Ultimate Rewards, and Delta is a partner of American Express Membership Rewards, but you won’t find American Airlines in the transfer partners list of major credit card rewards programs. That, however, doesn’t mean you can’t fly American using the points from these programs and Citi’s ThankYou program. In fact, your American Airlines options are even more plentiful since they are available through all three points-based programs. Here are the airlines and transfer partners in parentheses that can help you find a seat on AA metal using these partner programs. There are other transfer partner airlines that can help you book your American flights, but we can’t recommend them due to complexity and/or poor values of their frequent flyer programs. The best way to use British Avios on American is booking short flights in economy for 7,500 and 10,000 Avios. Unfortunately, British removed the ability of booking ultra-short hauls (up to 650 miles) for 4,500 miles in the U.S., so 7,500 Avios is as good as you can get. Still, using Avios for short nonstop flights on American can be a great deal. A regular American redemption rate for the Continental U.S. is 12,500 one-way and for the Mexico/Caribbean/Central America destinations, 17,500one-way. Although American added a 7,500-mile redemption level back in 2016, it’s for flight distances shorter than 500 miles (versus 650 miles for Avios). Here are some examples of great British Avios deals. There are good deals on some longer Avios flights, too. You can get to Hawaii fror LAX for 25,000 AAdvantage miles. However, with all the good features that come with Avios, there are things to avoid like using British Avios on business and first class awards on American, as they charge you up to four times the economy rates. Avoid booking connecting flights, because you will pay separately for each segment. And don’t use Avios to fly American to Europe – British adds substantial fuel surcharges to American flights between Europe and the U.St. Even though the name is the same, the Iberia Avios program works differently than British Airways Avios. The major inconvenience is that you must pay for the round trip (you can redeem one-way flights, but they cost the same). However, if you’re okay with round-trip flights, Iberia Avios has three major advantages. 1. Flights shorter than 300 miles each way cost 11,000 Iberia Avios. Considering that the cheapest flight originating or terminating in the U.S. would cost 15,000 British Avios, that’s a 4,000 difference in Avios. 2. Flights shorter than 500 miles each way cost 12,000 Iberia Avios – that’s a 3,000 difference in Avios. 3. And you can use connecting flights, because Iberia Avios doesn’t calculate each segment but only the distance between the origin and the destination. Here are some examples of great Iberia Avios deals (roundtrip). Keep in mind that each of these flights would cost you 15,000 British Avios roundtrip. Using Cathay Pacific miles is a good idea for flying some short hauls on American if you’re okay with round-trip flights, since Cathay Pacific charges more than 50 percent for booking one-way flights. The best bet to save miles is Band S (one-way distance up to 600 miles). You will pay 15,000 Asia miles per round trip, which is a good deal – it’s better than American (15,000 AAdvantage miles for a 500-mile distance) and British Airways (15,000 Avios for 650 miles). But there is even a better deal to be found in Band C (5,000 miles). It would cover all flights to Europe from the Northeast (except Turkey, where American doesn’t fly anyway). You pay 45,000 Asia miles in economy and 80,000 miles in business vs. 60,000/115,000 AAdvantage miles. American also has a 45,000-mile redemption level to Europe, but only in January 10 – March 14 and November 1 – December 14. With Cathay Pacific miles you can fly anytime. 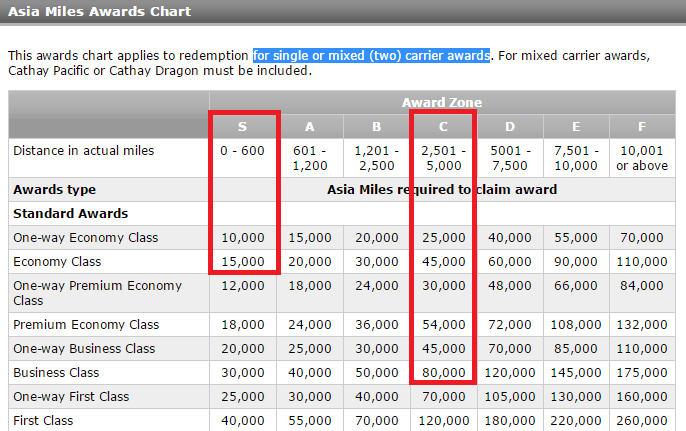 Unfortunately, you can’t book an American award flight on the Asia Miles website. You can submit your request online, or call 1-866-892-2598. Using Etihad miles to book an award flight on American is like going back in time. Etihad still uses an old, pre-devaluation American Airline award chart that offers some terrific values we’ve been missing for almost a year. You can redeem 20,000 Etihad miles for an Off-Peak flight to Europe and southern South America or 67,500 Etihad miles for first class flights to South East Asia (one way). And the old Off-Peak dates severely reduced by American in Spring 2016 are still valid on Etihad. Etihad’s American Airline award chart. We covered the process of booking an American award flight on Etihad in great detail. As a reminder, you need to call 888-8-ETIHAD and be patient – not all Etihad agents are proficient in booking partners awards. And if you feel that you get nowhere after a while, just hang up and call again. There are three other Citi ThankYou transfer partner airlines that you can use to book American flights, but probably shouldn’t: Qantas, Qatar, and Malaysia. The first two offer terrible award values and Malaysia, which is slightly better, has a convoluted booking process. This post will tell you how to earn points from each rewards program. Use Cathay Pacific to book round-trip nonstop short-haul awards and long-haul flights to Europe and South America, especially in business from the East Coast. Use Etihad to book any American award at the pre-devaluation AAdvantage rates, but be ready to spend some time on the phone.